• The uncoupled bioreactor MFC: microbiological hydrogen production or methane production (with subsequent reforming) in a separate bioreactor followed by a chemical fuel cell (generally high temperature SOFC) to convert hydrogen gas into electricity • The integrated bioreactor MFC: microbiological hydrogen production and hydrogen to electricity conversion in a single cell. • The MFC with direct electron transfer: microbiological electricity generation and direct electron transfer to the anode. 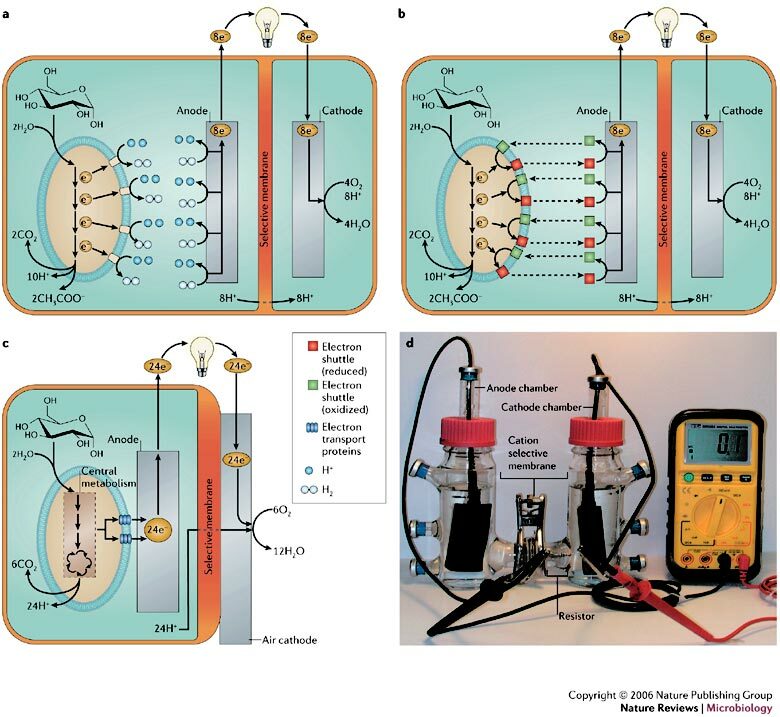 • The MFC with mediated electron transfer: microbiological electricity generation and electron transport towards the anode by means of electron shuttling mediators. Since micro-organisms act as a catalyst in the transfer of electrons from the substrate to the anode, the selection of a high performing microbial consortium (either pure or mixed culture) is of crucial importance in the ‘real’ microbial fuel cells. The electron transfer from the bacterium to the anode can proceed in a direct way from the bacterial membrane to the anode surface or indirectly by means of a mediator. Alternatively, biofuel cells exist, that use enzymes, which are immobilized on the anode surface. These fuel cells can not be regarded as MFCs sensu strictu. Due to the high costs involved in enzyme production, enzymatic fuel cells are only suitable for miniaturized small-scale applications. As a result, dimensions and corresponding power outputs are significantly smaller. Commonly used enzymes are glucose-oxidase and dehydrogenases.